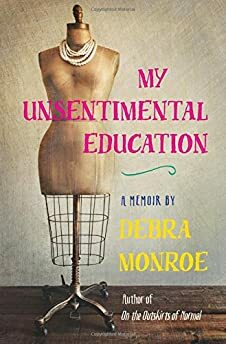 Largehearted Boy: Book Notes - Debra Monroe "My Unsentimental Education"
Book Notes - Debra Monroe "My Unsentimental Education"
Debra Monroe's honest, wise, thoughtfully told memoir My Unsentimental Education auspiciously launches the University of Georgia Press's literary nonfiction series Crux. "This picaresque memoir of a woman with brains and desires (not always operating in unison) is a joy. It tracks a runaway life with consummate control and aphoristic wit." Like Janis Joplin, I wanted "to do a [book] of great social and political import." This is a funny yet literate memoir about ex-boyfriends. And even ex-boyfriends exist in a cultural context. So it's a book about social class and gender: how the Horatio Alger story plays out differently for women, especially during that awkward era just after first-wave feminism. I'd heard that woman was man's equal yet didn't realize a few years of feminism wouldn't undo centuries of customs with regard to dating, mating. Some women no doubt navigated this impasse better than I did. I was naïve yet fearless. Or fearless because I was naïve. My comedy of errors played out for years. I'd moved from a small town—surrounded by farms, bars, strip joints—into the professional class. I had impostor syndrome by day, but at night I kept dating what the book flap copy politely calls "blue-collar men," though most were small-time drug dealers, guys in local bands, or unemployed. My playlist is incongruous because conflict is incongruous: two unlike things conjoined. Comedy is incongruous: two ludicrously unlike things conjoined. My playlist is as incongruous as my life was. I wanted to be many selves: a housewife, a country-western singer's sidekick, a drug dealer's moll, a professor who easefully quoted Sartre, Shakespeare, Longinus. . . I don't like "Annie's Song" by John Denver, but listening to it at age 15, engaged to a 22-year-old telephone man, I realized that if he didn't understand that love might feel like "night in the forest," then I'd default to my mother's theme song, "Is that All There Is?" by Peggy Lee. I turned 18 and ran off with a 35-year-old man who was wanted in Indiana. Illusory freedom felt like "Theme from a Summer Place" by the Percy Faith Orchestra, but the rest of the experience felt like "Rage in the Cage" by the J. Geils Band. Next I went to college where I juggled a waitress job, homework, and new love. Mutual regard surged, wariness too. Regard + wariness = hope forcing its way through gloom toward light. One song, for him, not for me, a requiem: "I Wish I Was Your Mother" by Mott the Hoople. I started a master's degree married to a country-western singer, though he left me, but no one noticed at first because we were at a Halloween party in costume. As a divorcee, I saw myself as the latter-day Greta Garbo, mysterious, aloof, though I dated a felon and also a hog farmer with courtly manners. "Up Against the Wall, Redneck Mother," by Ray Wylie Hubbard, for my cowboy's-wife persona, and "After You, Who?" by Cole Porter, for my Greta Garbo-persona. I was working on a PhD in Utah when I married a short, angry man, probably because he wasn't a Mormon, and everyone else was. The Mormon concept of foreplay is chaste but addictive: ice cream. "Constant Craving" by k.d. lang. I wasn't craving ice cream, but I wasn't sated either. When I moved to North Carolina, now a professor not much older than students, my short, angry husband insisted I take out the best life insurance with him as beneficiary, and he tinkered with my car brakes incessantly. I came to my senses. "Let [Him] Cry" by Hootie and the Blowfish. I moved to Texas to be single, undomesticated. This involved honkytonks, including an abandoned dance hall in a mercury mining ghost town, but my most loyal companion during the night life, which ain't no good life (Willie Nelson), was a massive coonhound who'd failed obedience class and assumed I was his wife. "Gin & Juice" by Snoop Dogg. "At Last" by Etta James is a popular wedding song, but I'm including it because it has the word "last" in it. I was a climacteric June bride, our wedding coinciding with serial funerals and the scariest health scare so far, though there'll be more, I'm sure; I'm mortal. But as happy as a mortal can be. "I Saw You Coming Back To Me," covered by Rickie Lee Jones, because I didn't get this far without ghosts, exes as mental excess, recurring dreams that an ex-boyfriend, decades younger than me, is waiting in the next room for me to write him a letter of rec to jumpstart his future.